Kyle, how did your career path lead to your current role? I started out in the ad agency life and then went client side in e-commerce. From there I landed in recruitment marketing and view a job requisite as a SKU. It’s a number that has a lot of attributes to it and you can track nearly everything thanks to a little barcode. The technology themes in e-commerce are coming to recruitment marketing which is great to see; we track so much more today we did even a few years ago. Some days there are several meetings and others there are a lot of open hours which I love because I can spend time talking to people and learning what they are focused on; whether they are close to me or my team or not. I try and get down every row in our department and talk to someone from all the teams each week. We spend a good amount of time reviewing results, but the team is really solid in their understanding of what is good and what is not. This gives us more time to focus on our approach in the future. What do you enjoy most about marketing? Seeing how the work our department does connects to the business. It’s measurable and testable which allows new thoughts and plans to come up. How important is the candidate experience for your firm? It’s very important and getting more important every day. The more you automate mundane tasks, the more you can think about ideas that will move the needle. What metrics do you use to measure success? Our big ones are: volume & quality of candidate; awareness and perception of the brand and industry. How do you see technology changing your day-to-day? I see it making it more efficient as well as challenging. There is an explosion of technology and picking the right solution for problem can be challenging since there is so much overlap. Areas where I see it growing are automation, machine learning and other programatic tools that help the candidate experience. How does automation play into your current candidate engagement process? We use automation in our recruitment media buying program as well as our email program. The more you automate mundane tasks, the more you can think about ideas that will move the needle. 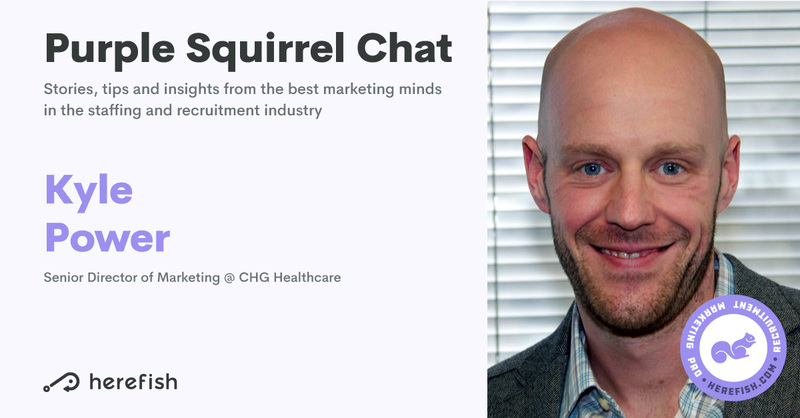 What do you see recruitment companies doing right or wrong in terms of marketing? I see a lot of positive momentum in the industry. One thing that comes to mind is that each company can have a different process and it can work for them. Trying to copy someone else usually leads to poor results. Focus on what works for your organization and improve from there. Don’t try and game the system. That is not good for anyone, including the candidate. Conferences and trying to stay connected with industry contacts. What is the one piece of advice you’d have for marketers in the staffing and recruitment industry? Focusing on a “test and learn” mentality and setting aside resources for it (people and budget). Don’t chase shiny objects just because they are new or written about. Find things that can be tested and can possibly improve results and workflows. I enjoy fishing in Montana and seeking some of the best craft beers in the country when I travel. Special thanks to Kyle for sharing with us today. If you or anyone you know would like to be featured on our site, please send an email to marketing@herefish.com. What is a Staffing Employment Brand?